Our monogrammed short waffle robes make for a great personalized gift! Perfect shower gift, wedding gift or any occasion gift from Lovingly Ours! The guests or family members can use their personalized monogram robes during the reunion. It is a thoughtful and practical gift that everyone can use for years after. It is also a great gift suggestion for birthday, bachelorette parties, sorority parties and school or family reunions. The light and comfortable short kimono waffle weave robe with embroidered monogram or name is rolled and wrapped individually in a clear bag so it's ready to give as a gift. Choose from blank, front embroidery or front and back embroidery. Front embroidery can be in the form of a monogram, embroidered name or first initial. - Similar to waffle weave spa robes are used by five-star hotels and spas. 1. Please choose the quantity of robes and personalization options - blank, front embroidery or front and back. a. Date you need your order. Pls. note that processing time is 2-3 weeks. However, send us a message through etsy or custom order if you need your order sooner. b. Color of the robes. Check out the options available in the photos of this listing. You can mix and match the colors and sizes. c. Thread Color. You can also use different colors for each robe. d. Name or Monogram Initials*. Pls. 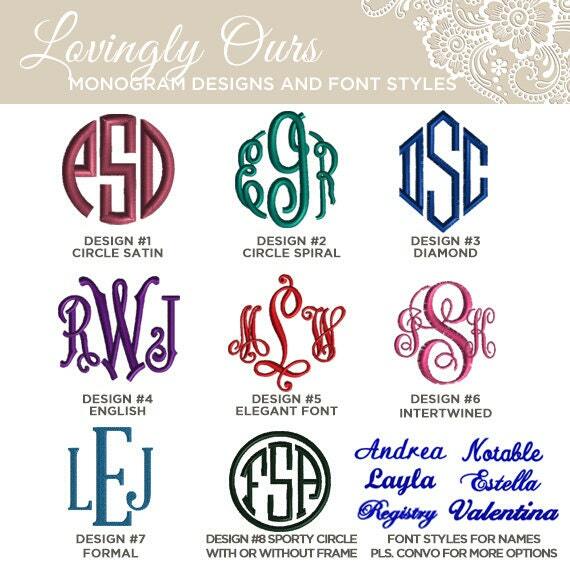 make sure to write the monogram initials in the way you want it embroidered. It's usually in this order - FirstName, LASTNAME, MiddleName Initials. Example: Emily Ann Smith will be ESA with the S being a larger letter than the other two. You can also choose to just have the first name initial or first name. e. Monogram Design or Font Option. Go to https://img1.etsystatic.com/120/0/10472166/il_570xN.922452599_6puv.jpg to view the different monogram designs or font styles. f. Robe sizes. Write the size next to the monogram or name. The size info is listed below. An additional $5 per robe is added to XXLs, go to https://www.etsy.com/listing/258409218/xxl-robe-upgrade and add this to your cart when ordering XXLs. Monitors might display colors differently. When in doubt, send us a message and we'll send you an iphone photo of the robe with your thread selection. a. One Size fits most or Large. Fits women up to size 16-18 or XL. If size is not mentioned in the order, the default size that will be used for your order is One Size/Large. c. XXL Sizes available in white, black, taupe, blush, light pink, gray, navy, periwinkle, turquoise, mint, coral, purple, and lavender - an additional $10 per robe is added to XXLs, pls go to https://www.etsy.com/listing/258409218/xxl-robe-upgrade and add this to your cart when ordering XXLs. ➡️ Kid sizes: also available in white, black, blush, light pink, gray, navy, turquoise, mint, coral, purple and lavender.